GOSHEN — After a battle against cross-town rival Burke Catholic, Goshen was suiting up for its second game in three days. This time around, the result was not one that the team, nor the fans in the Coliseum had hoped for. Goshen (5-1) lost their first game of the season against Minisink Valley 62-59. The Gladiators started the game hot on offense, with senior guard Zack Foley scoring 11-of the teams’ first 15 points. He finished the game with 25 points, six rebounds, four assists, and four steals. Junior wing Matt Giordano tallied a routine double-double with 12 points and 15 rebounds. However, the offensive juggernaut that has been present throughout the season thus far could not mask the plaguing issue on the other side of the ball. Minisink Valley (2-5) deserved to win the game. The Warriors were scorching hot with the barrage of jump-shots that were falling from absolutely anywhere. They shot 53% from the field, and 50% from three-point range, (10/20). Minisink’s youth movement certainly has a bright future for years to come. Their three leading scorers were all underclassmen. Sophomore guard Alex Krupinski scored 18 points on 7-of-13 shooting along with two steals. Junior guard Drew Santa Lucia added 15 points, two assists and three steals. Sophomore guard Andrew Tanous was also a key contributor for the Warriors, finishing with 9 points, five rebounds, and three assists. Throughout the game, the energy was low from Goshen in every aspect. Players were frustrated — especially with a loss to a team in the division — and one who the Gladiators felt were vulnerable since the majority of their team are underclassmen. Foley with two of his 11 first quarter points, he finished the game with 25. Goshen should be able to comeback after the loss. The group is too talented to not bounce back from a tough loss. As a unit, the team must work together and communicate more to make the game easier, which hopefully makes for better outcomes moving forward. Coach Mike Tangney knows this too, as a fifth-year head coach should. There is no room to overreact and sulk after one loss following a fantastic start to the season. “We ran into a buzzsaw of energy and execution tonight,” he said. 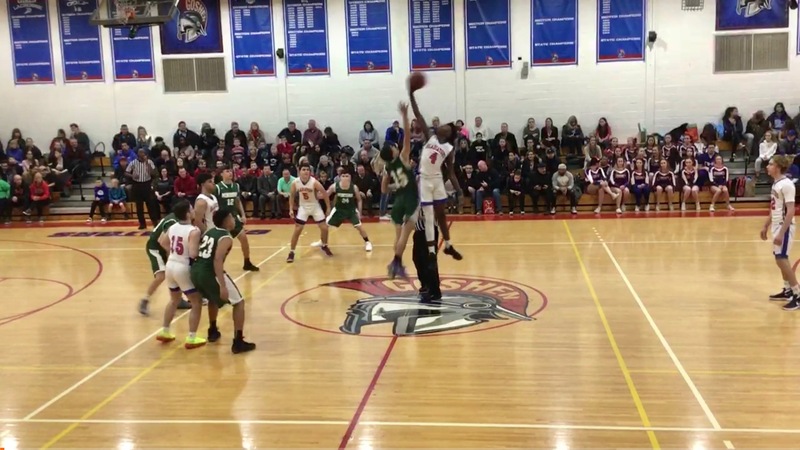 Tangney praised Minisink’s toughness and effort they displayed throughout the night, and hoped his team could replicate what opposed them on the court. “When you have to defend a team that has nothing to lose, it puts you in a position to overextend and undervalue how important team defense is at the high school level. Anyone can get hot any given night. Teams who bond together like that and give everything they have on the floor is really special so we just have to match that intensity going forward,” he added. Goshen faces another division rival Friday, traveling to Port Jervis, as the Gladiators look to bounce back against the always pesky Red Raider team.